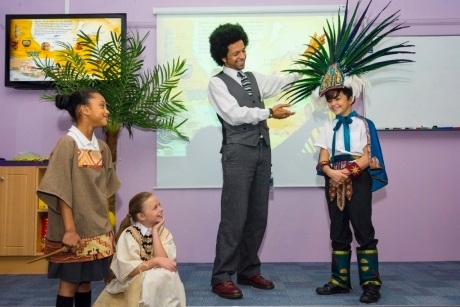 The education team at Cadbury World in Birmingham is celebrating its 25th anniversary this year, and there are plenty of workshops on offer for schools visiting in the near-future. The education team has grown from a part-time team of one to a professionally trained full-time team of four over the last quarter of a century. The Bournville-based attraction welcomes more than 2,000 schools and a total of 100,000 individual students per year through its doors. Cadbury World boasts two dedicated themed education rooms, which are used as a base for talks, workshops and demonstrations. Cadbury World offers a portfolio of 18 specifically designed one-hour curriculum-linked talks for Key Stage 1 through to Key Stage 5. Topics ranges from History, Design & Technology and Business, to Geography, Science, ICT and Leisure and Tourism. One of the attraction’s talks is about Business Studies Marketing, and has been developed to educate pupils on product design and marketing. As well as teaching students how the Cadbury brand manufactures some of its most popular products, the Business Studies Marketing session gives pupils an insight into the UK confectionery market and social media marketing. Meanwhile, Bean to Bar is a discovery talk about the origins of the cocoa tree through to the chocolate making process. Workshops include a Science session for Key Stage 4 that explores Cadbury productions and location of industry, the function of the Cadbury Science and Technology department, the role of a sensory evaluator (chocolate taster) and health and safety in the workplace. Alternatively, a Design & Technology workshop for Primary students gives participants the chance to identify target markets, discover functions of packaging materials, and see real chocolate moulds from the Cadbury factory. Further highlights on a school trip to Cadbury World include Advertising Avenue, the Aztec Jungle (a representation of an area where cocoa beans originate from) and the Chocolate Making Zone. For more information on educational talks or to book a visit to Cadbury World, visit www.cadburyworld.co.uk.